This Feiss English Bridle 3 light large outdoor wall lantern in black is rated IP44 and features elegant Georgian style and seeded glass shade. Boasting a detailed cameo style wall mount and scrolled over-arching arm supporting a large downward facing lantern in black; featuring a stepped roof and curved lantern frame, with decorative banding and open fretwork detail, seeded bell glass shade, lower scrolled detail and mushroom finial. Three candle style lights sit inside and shine through the sides and bottom for an excellent, bright all round light. This collection reflects English countryside charm combined with the graces of a stately manor. The clear seeded glass combines a clean look with old-world charm and looks fantasic on the outside of any older, traditional or period home. If you are searching for quality outdoor lighting in a classic Georgian style, the English Bridle suite should be considered. Fully weatherproof and supplied with a manufacturer’s 3 year anti corrosion warranty, which relates to the corrosion of finishes on lights like this one. Locations within 5 miles of the coast are excluded. There are matching fittings in the English Bridle outdoor range that includes large, medium and small wall lanterns, a lamp post, post and bollard lights and hanging porch lantern; please see below. Also available finished in British bronze; please enter the term English Bridle in the search box at the top of this page to view the full collection. This outdoor light is supplied by Elstead Lighting and designed in the USA by Feiss, founded in New York in 1955. 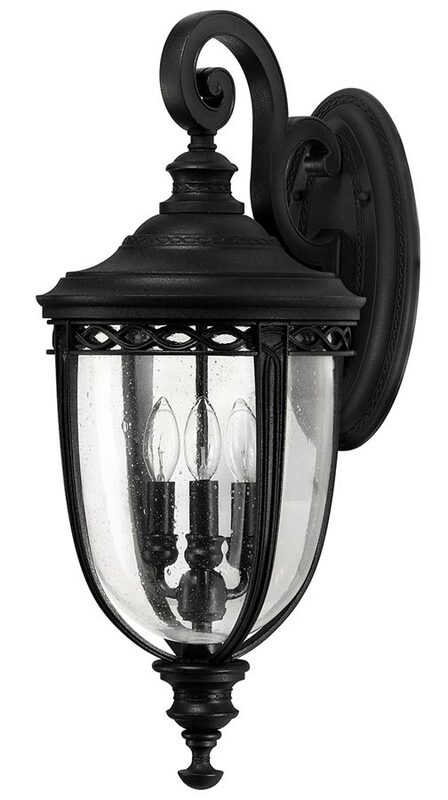 They have become well known over the years for their contemporary yet classic styling, quality and great original designs like the English Bridle 3 light large outdoor wall lantern in black you see here.